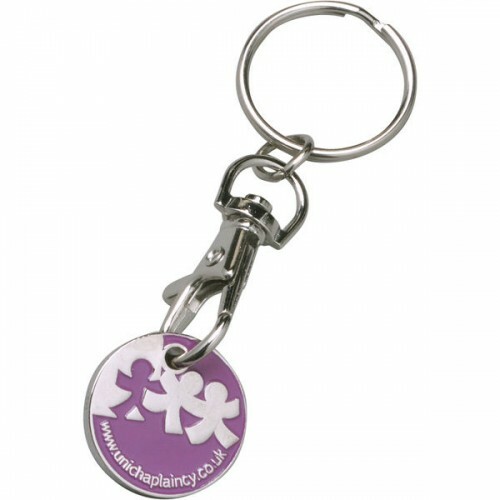 This promotional personalised Trolley Coin Keyring is a great item that will get guaranteed use time and time again with your message in view. It is perfect in any returnable vending device supermarket trolley, gym locker, etc. It is a metal alloy disc that is a one pound size (or Euro size upon request) supplied on a keyring with a spring clip. 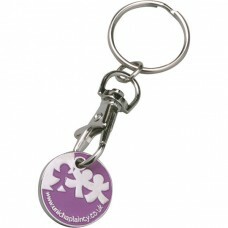 These promotional keyrings are die stamped 1 sided and infilled with up to 4 soft enamel spot colours. Price includes silver nickel plating and trigger clip fitting. Other plating colours and print options available on request. Dimensions: 21mm x 21mm. Print area: 20mm x 20mm.